These days I’m always looking for nice vegetarian recipes for “El inglés” aka my hubby, he doesn’t want to eat meat anymore, good for him! 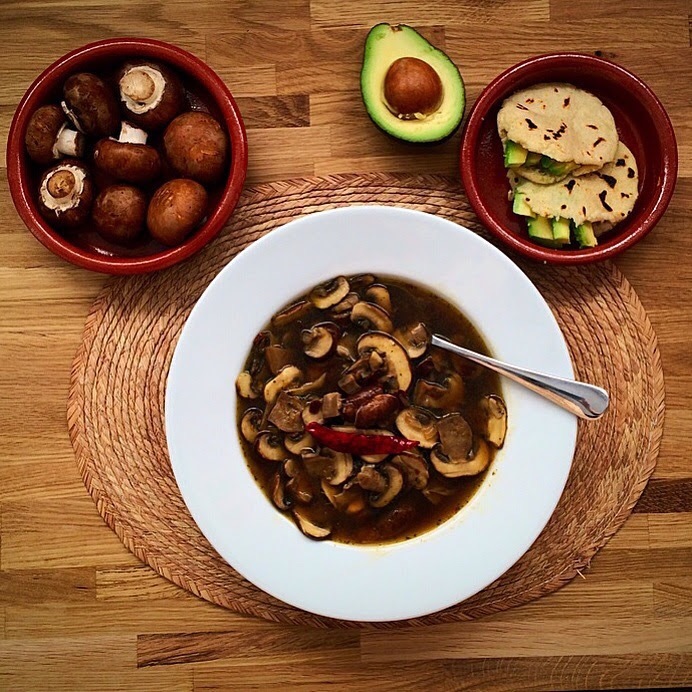 so I decided to cook this soup I once had in a restaurant in Mexico, I ordered it thinking that it was going to be the typical creamy mushroom soup and for my surprised it was this yummy mushroom broth top up with errmm!! lots of arbol chillies. Despite the chillies the soup was divine, I had mine at the restaurant with some “gorditas” which are the corn patties that you see in the picture, but you can have it with bread or tortillas. Heat the oil in a large caserole dish and fry the onion until they soften, then add the mushrooms and dry them for 15 min stirring from time to time. Add the vegetable or chicken stock and the arbol chillies. Add salt and a pinch of pepper. Cook for 15 min. Serve in a bowl and accompany it with corn tortillas or some gorditas filled with avocado. I used organic chicken stock and I avoid adding salt. benefits so this is perfect timing for this recipe – sounds delicious – thank you for sharing this recipe! Such an appetizing presentation Karla. A mi me encantan!! Meatless dishes can be some of the most delicious. A fresh bowl of beans with aguacate and tortillas. No hay nada mejor. Saludos! Hola Vanessa, welcome to my blog! I get my ingredients from different places, but usually my dry chillies I buy them from either MexGrocer like you or CoolChile and yes, I totally agree with you, shipping is quite expensive, I usually team with some friends and we order a lot and we share the shipping cost.